How can a sleep formula be a performance supplement? After all, you’re not performing – you’re sleeping. Right? Performance Lab Sleep doesn’t see it that way. Instead, it enhances cells’ regenerative performance by extending the deepest sleep phases of cellular repair. The result? Waking up with more energy, with a body that has been optimally repaired and revitalized at a cellular level. Let’s check out how Performance Lab Sleep gets there with just three ingredients in this review. CherryPURE®. Highly concentrated Montmorency cherry extract that supplies melatonin while soothing achy joints and muscles. Magnesium 3 ways, w/ BioGenesis™. Multiple forms of a muscle-relaxing, nerve-calming mineral that many are missing. TryptoPure®. Naturally releases sedating brain chemicals for better sleep at night while reducing daytime stress, for healthier sleep cycles. Other Ingredients: Plantcaps® Capsule, NuFlow® Rice Concentrate. Suggested Use: Take 2-4 capsules 45-60 minutes before bedtime. For best results use daily and consistently. Extend and enhance your deepest, most regenerative sleep phases for vitality, performance, muscle growth, health and more. The 500 mg CherryPURE® serving found in Performance Lab Sleep supplies the melatonin found in 25 Montmorecy tart cherries. As a reminder, melatonin is the leading natural sleep supplement, which is released when we turn out the lights to bring on feelings of sedation and sleepiness, and then is inhibited when exposed to daylight, then signaling for the brain to wake up. Tart cherry is a superior sleep supplement because it supplies more than just melatonin. Tart cherry also supplies a complex of natural antioxidants that have inflammation-modulating activity. This is why cherries are famous for easing joint pain and muscle aches, and has become popular in joint supplements. By soothing aches, Performance Lab Sleep targets a different pathway for helping you to fall asleep and stay asleep. Magnesium is important for sleep because it helps to settle the central nervous system, relaxed muscles and reduce blood pressure – all biological activities that precede falling asleep. The problem is, some people don’t get enough magnesium. This is partly due to the fact that it becomes harder to absorb as we age, but also has to do with some supplement forms of magnesium having poor absorption and bioavailability. Together in three bioavailable forms, Performance Lab Sleeps magnesium has a calming effect on the entire neuromuscular system, and has been shown to help with periodic limb movements that disrupt sleep, including restless leg syndrome. The BioGenesis™ Magnesium Advantage: Magnesium can make a big difference when it comes to muscle relaxation and deep sleep. However, some cheaper magnesium forms are very hard to absorb. BioGenesis™ is a new kind of vitamins and minerals (including Magnesium) that was created by Performance Lab. The idea is, it is grown in a hydroponic lab setting on cultures — making it identical to whole-food magnesium structurally, but cleaner. Bottom line, BioGenesis™ magnesium is easier for the body to absorb and use, which is a big advantage when it comes to magnesium sleep benefits. L–Tryptophan is an essential amino acid “starter compound” that is enzyme-converted in the brain into neurotransmitters (especially serotonini) that create a relaxed, mood-balanced and sleep-ready mindset. 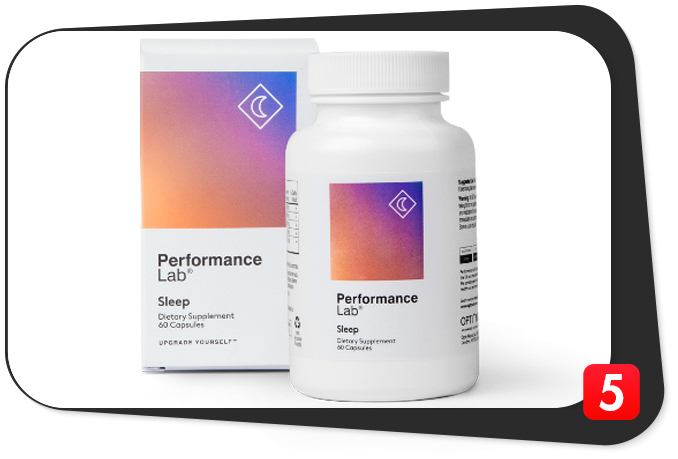 Performance Lab Sleep positions this ingredient as helping with stress-induced sleep problems — both in the short term (helps you fall asleep fast) and in a bigger sense (helps with stress-insomnia cycles). L-Tryptophan is good for stress-sleep problems because it helps with deep sleep at night and positive relaxation during the day — maintaining healthy sleep patterns over time. Tryptophan also helps to raise melatonin levels and stimulate new melatonin synthesis. This is a cool factor of Performance Lab Sleep’s design, because L-Tryptophan naturally raises melatonin, while its tart cherry supplies melatonin — a smart 2x synergy for sleep, right there. Performance Lab Sleep is not the only formula to take a multi-pathway approach – but it is the best. Formula execution is key here – three ingredients in top-self forms, each with enhanced potency and unique sleep bioactivities, delivered in a clean vegetarian plant capsules. Athletes: Performance Lab Sleep has some properties of a post-workout supplement because it deepens sleep phases associated with anabolic growth. Performance Lab Sleep builds on that by helping with training-induced joint and muscle aches that can make it hard to sleep after training. Adults over age 40: Performance Lab Sleep’s magnesium and bioavailability enhanced forms is great for age 40+ because magnesium gets harder to absorb as we get older. Enhanced-absorption BioGenesis™ Magnesium helps with this, and can make a big difference in sleep quality. Performance Lab Sleep is designed to eliminate side effects. Right down to the smallest details, like using natural cherry melatonin instead of synthetic melatonin. It claims to be non-habit-forming, and we see no reason to think otherwise. It’s just three ingredients, all in enhanced forms, in a vegetarian capsule with no artificial colors or synthetics or anything like that. Helps you fall asleep. A potent 3-ingredient combo that instills feelings of drowsiness via several different pathways. Keeps you in the best sleep longer.. This extra layer of support explains their “regeneration support” claims. Clean label. Just 100% vegan plant capsules made from natural pullulan, free of preservatives, additives, colors, and other pointless garbage. Non habit-forming . No synthetics or exotic sleep aids, just fundamental mineral, botanical and amino nutrients that are safe and well-tolerated. Lower-end melatonin dose. Smaller dosage than the melatonin supplied and synthetic sleep supplements, but also helps the body naturally raised melatonin production, which may compensate for the lower dosage of natural cherry melatonin. Not available in stores like GNC. It’s not for sale at Amazon, either. To buy, you have to go to the Performance Lab website. Performance Lab Sleep is an intelligent natural sleep aid that works in harmony with the body’s sleep rhythms to promote a deeper, more regenerative quality of sleep — for superior daytime performance. With its clean label, advanced design and premium research-backed ingredients, Performance Lab Sleep is the best natural sleep supplement on the market today.